Reference number for this case: 15-sep-54-Tarbes. Thank you for including this reference number in any correspondence with me regarding this case. On September 15 at 03:30 p.m., Mr. Hatchondo, a schoolteacher of the Gers, saw a smoke trail in the sky above the Arras valley, the Gers hills and the plain of Tarbes, then a brilliant object was seen in front of this smoke. The object disappeared, but then it reappeared leading a second smoke trail which crossed the first. Suddenly, it made a fantastic jump, and disappeared towards the northwest. On September 15th at 3:30 p.m., M. Harthonde, a schoolmaster of Gers, saw a smoke trail in the sky above the Arros Valley, the Gers hills and the Tarbes plain. Then a brilliant object was seen in front of the smoke. This disappeared, but then it reappeared leading a second smoke trail which crossed the first. Suddenly, it made a fantastic jump, and disappeared toward the northwest. The website indicates that on 15 September 1954 at 17:30 in Gers, France, "One object was observed by two witnesses in a yard (Hatchondo)." The source is noted: "Newspaper Clippings". Not looked for yet. Possible airplane. 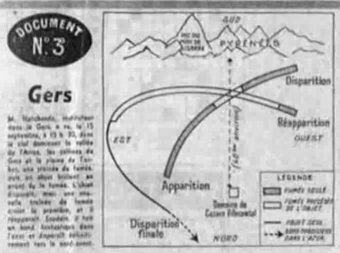 [fd1] Article in the national weekly newspaper France Dimanche, Paris, France, page 2, September 1954. 1.0 Patrick Gross May 24, 2009 Conversion from HTML to XHTML Strict. First formal version. Addition [ud1]. 1.1 Patrick Gross December 16, 2016 Addition [lg3].